A simple building form with exceptional features, US Federal Properties (USFP) developed this 30,000 square-foot building in Austin, Texas, which houses the Social Security Administration. Deep overhangs and a vented clerestory vault allow excellent light penetration with negligible heat gain in a rectangle building. The split face concrete masonry units offer affordable and contemporary material, simulating the native stone found in the area. 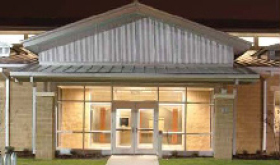 A galvalume standing seam metal roof was selected for its longevity and gives the building a contemporary feel. Working to stretch the budget as far as possible, USFP incorporated quality interior materials to extend the useful life and reduce maintenance issues for the high-traffic building.